New West Theatre has been forced to shift the timing of their season due to the delays in renovating the local semi-professional theatre company’s home of The Yates and Sterndale Bennett Theatre. 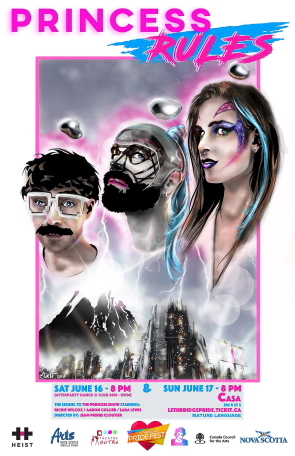 But in addition to rethinking venues, they also decided to refocus their image of being best known for their always popular musical comedy revues. ““Rockers Gone Country’ was going to be our first show in July. It was already cast but we had to move it to February. So we gave the actors cast in it first right of refusal. Some of them were only available for the summer. Some of them are available for this show. But the show also falls on Valentine‘s day, which is a great date night,” said New West Artistic Director Sharon Peat. “ It’s all about songs which were number one on both the country and pop charts,” she said. they are trying something completely different, by putting on the Tony Award winning musical “Million Dollar Quartet for their first show of the season, Sept 12 at the Yates Theatre. “It’s the first time in years New West has done a musical. It’s about Sun Studios musicians Jerry Lee Lewis, Johnny Cash, Elvis Presley and Carl Perkins. It’s based on an actual recording session they did in 1956. It’s like being a fly on the wall of Sun Studios, so you learn all about these characters, and of course there’s the music,” Peat enthused. 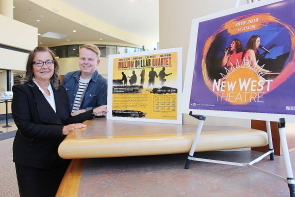 She is also excited to bring back “Night Life,” a cabaret in the Sterndale Bennett Theatre. Nightlife 2.0. runs Nov. 16 and 17. “We’re super excited about the second show. It’s adult based, so it’s not for families. It’s New West after dark,” Peat described. The first musical comedy revue of the season is their Christmas show, “Hit Parade,” running Dec. 18-Jan. 5 in The Yates Theatre. It will combine comedy with plenty of favourite hits. Their beloved Munsch Theatre for young people show returns for Christmas as well as Munsch-O-Rama explores Munsch favourites ‘50 below Zero;’ ‘The Paper Bag Princess,’; ‘Thomas’s Snowsuit’; ‘PIGS’ and ‘Something Good.’ It will be running at Casa, Dec. 26 -Jan 5. Peat is especially pleased to present Evan Placey’s play “Girls Like That,” which explores teens in the age of the Internet and social media, May 1-11 in the Sterndale Bennett Theatre. 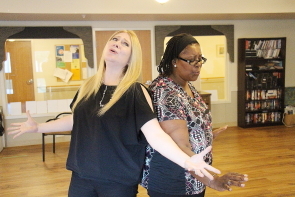 Two SOAR festival cabarets were sold out successes at Casa, May 30 and 31. Each one featured the dance of Claire Lint, magic and music. I only caught Mentalist Jeff Newman‘s new act “Trickster” at the May 31 cabaret, having to go it in between play rehearsals. The always affable Newman premiered the new show with his usual humour and a lot of crowd participation. He got one audience member to look after a locked box throughout the show, then got other audience members to help with a variety of tricks including remembering a card without showing him, only to have it turn to a blank deck. It was strange as I was looking over the shoulder of one of the volunteers and saw the six of hearts, but was boggled by the deck turning blank after the volunteer tossed it back to him. He prefaced the next bit by talking about his ability to guess the contents of Christmas presents and about how his parents would just speak in German when they didn’t want him to know what they were talking about. Coninciding with that story, he performed another neat trick by hypnotizing another audience member into speaking German,which matched with German words written on flash cards which I couldn’t read from my spot at the back of the room. He wound down his show by having yet another audience member guess which present contained either a plush green dragon, dog or cat. 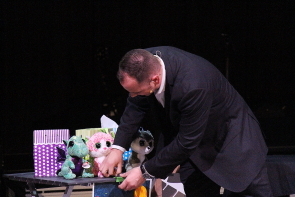 He had the audience member switch the critters and shuffle the boxes she put them into, and then take them out of their boxes and put them into colourful gift bags behind a barrier, which he predicted on a birthday card he opened after the bit. I had to leave before finding out what came of the locked box. Lethbridge Musical Theatre continues the story of Sister Mary Amnesia, Sister Robert Anne, Sister Mary Leo and the Mother Superior, who were forced to hold a fundraising concert to bury their dearly departed sisters who died from eating poisoned soup and who they couldn‘t afford to bury otherwise in the musical Nunsense. Lethbridge Musical Theatre put on the original production in 2016 and return with the sequel Nunsense 2, June 14-16 at the McNally Community Centre. The sequel is a thank you concert for everybody who supported the nuns the first time, like in the original, everything that can go wrong does go wrong in the sequel — particularly revitalized Sister Amnesia, whose lottery winnings saved the day in the original, whose memory is slowly returning. This time she may be a Franciscan, she just forgot about it. Stephanie Savage is excited to make her musical debut in Nunsense 2 as novice nun Sister Mary Leo. “I took drama in high school. I’ve never done a musical before, but I’ve always wanted to be in a musical. It’s interesting, but three of the five of us have never really done anything like this before. It’s been a lot to learn, but it is a lot of fun. We have a really dedicated cast,” said Savage, who is also stage managing Shakespeare in the Park’s production of The Tempest, which opens June 28. “Luckily I have a great assistant stage manager, Shelby Reed, for the Tempest. And Kate (Connelly, Shakespeare in the Park‘s artistic director,) has been really wonderful and amazing,” she continued, noting Nunsense 2 is a fundraiser for a bigger Lethbridge Musical production in the fall. “It’s been a lot of work but a lot of fun. Sister Leo is the novice. She’s young and sweet and definitely wants to be a star,” she said. She is joined by Hannah Lawson as Sister Robert Anne, Jan Jelli as Sister Hubert, Christina Peterson as the Reverend Mother and Monica Baczuk, the last nun standing from the last production, who played the Reverend Mother in the last production on Nunsense, but plays Sister Mary Amnesia in this production.